So my son turned three and how did that happen? That book everyone was obsessed with for a hot second. The Colour Thief – A touching story about discovery and sharing. Silly, quirky and more than a little brilliant. Meet the Dullards is anything but dull! 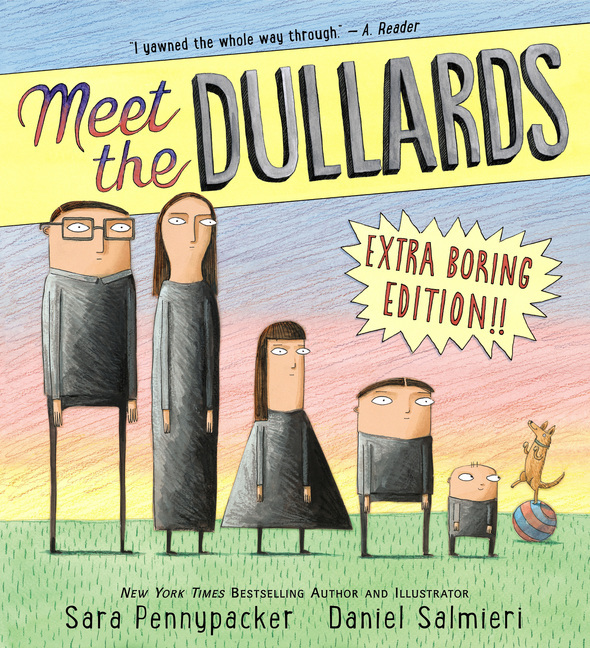 Meet the Dullards, written by Sarah Pennypacker and illustrated by Daniel Salmieri, details the plight of Mr. and Mrs. Dullard. When they catch their children reading – GASP! – something must be done immediately! Their children are expected to lead dull, ordinary lives; stimulating past-times such as reading are not acceptable! What is a tedious and dull set of parents to do? Move, that’s what! But children are resourceful. When the Dullards get distracted watching paint dry, their plan goes awry. This book is awesome. Really, it is. It’s all those words I use to describe a story I’m in love with; creative, quirky, fun, different, clever. The author and illustrator somehow manages to make a story, which is quite literally about dull moments, delightful. What can I say beyond that? Author Sara Pennypacker can now count me among her innumerable fans. ← Sometimes simplicity is just divine!